This is a guest post that came to us via SeoEaze Inc. We love it because it contains seriously useful insights and advice that small businesses can implement to get a great foundation for brand awareness, lead generation, etc. Start-up culture is prevalent across the globe, yet the success rate is pretty low. This is why running a successful start-up is a mammoth task. There are dozens of intricate aspects of a startup that need your attention. Running our own company asks for an eye for details. Whether it’s managing the payments or development of the product, you have to be present at every step. That been said, I have seen many entrepreneurs ignore the marketing aspect of their startup, considering it to be an out-of-budget spending. However, marketing is not a liability it is often taken as instead, it is an opportunity to outreach the consumers. When done correctly, digital marketing can provide an excellent instrument to grow and accelerate your business. Here we will be discussing five ways to market your startup for maximum exposure and conversion. The digital landscape is all about the user-friendliness. Google has made it paramount for any startup to be mobile-ready to be a success. In March this year, Google rolled out its mobile-first indexing algorithm, that ensures that mobile-friendly websites are given a preference in search results. To make our results more useful, we’ve begun experiments to make our index mobile-first. Although our search index will continue to be a single index of websites and apps, our algorithms will eventually primarily use the mobile version of a site’s content to rank pages from that site, to understand structured data, and to show snippets from those pages in our results. The amount of Internet traffic from mobile devices increased 6 per cent last year. Previous user retention of desktop devices was higher than on mobile devices, but that segment also faced a drastic migration last year, here’s the change in numbers. These numbers suggest that you should ensure that your online marketing strategy considers mobile as an integral part. You should put new communication channels in place so that you can reach and engage your consumers on their mobile devices more efficiently. Updates may come, updates may go, but the content will go on forever. This is the rhyme you need to memorise and live by. Content can make or break your digital marketing strategy. Never underestimate the potential of quality content that can engage consumers. All your communication efforts stand on the quality of your content. As an entrepreneur, it is important that you ensure that the right content marketing strategy is in place to promote your startup. Video content will be on the rise in 2018. With a formidable content strategy in place, you will witness not only an increase in web traffic but the rate of lead generation will be boosted as well. Usually SEO is taken as a short-term project by startups, however, it is essentially a long-term investment. Google continuously updates its search algorithm and it is important that you make changes to your website to be compliant with those updates. Consumers today rely on their internet to get information on almost everything. Most probably you will be getting most of your leads from the internet and this is why it is important to beat the competition and catch the eye of your consumers first. Search engine optimisation is the only way to succeed in beating the competition and to rank in Google search. Your aim is to put as much content as possible about your brand on the internet through channels of social media, content marketing, video advertising, geo-targeting, SEM and more. That being said, as a startup you should only invest in platforms and tools that make sense to your business. Entrepreneurs should stay away from short-term gratifications and keep optimizing their digital assets for maximum exposure on the internet. 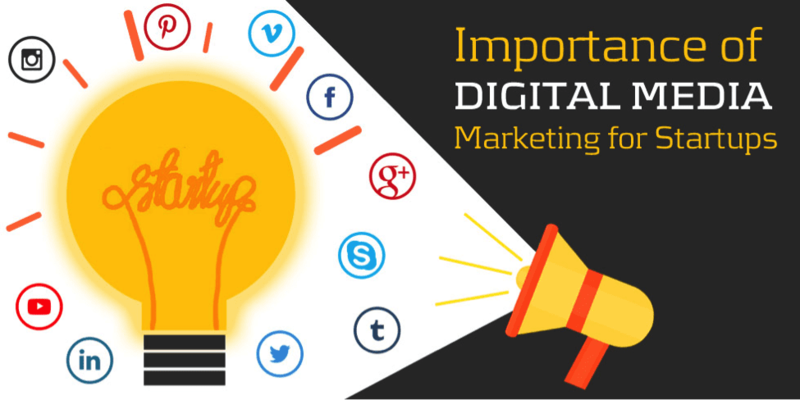 Digital marketing is a long-term process when done right can create a largescale impact. The digital marketing landscape keeps evolving and so does the technology. Startups in the early stages of their development should focus on both building brand and content creation. It is imperative that consumers experience your brand first before engaging with your product or service. This makes digital marketing vital for the success of your startup. We’d love to have your feedback and suggestions about this post. How is digital marketing working for your startup? Which strategies have worked really well for your company to grow sustainably? Please leave your comments in the Comments Section below.